HP Umpire Pat Hoberg ejected Cardinals C Yadier Molina and Manager Mike Matheny in the bottom of the 6th inning of the Cardinals-Cubs game. With two out and three on, Cubs batter Miguel Montero took a 2-2 fastball from Cardinals pitcher Michael Wacha for a called third ball before hitting an ensuing pitch for a three-RBI double. Replays indicate the pitch was located off the outer edge of home plate and knee high (px -.855, pz 1.700), the call was correct. At the time of the ejections, the Cubs were leading, 5-4. The Cardinals ultimately won the contest, 6-5. These are Pat Hoberg (31)'s second and third ejections of 2015. Pat Hoberg now has 17 points in the UEFL Standings (7 Previous + 2*[3 AAA + 2 Correct] = 17). Crew Chief Ted Barrett now has -2 points in Crew Division (-4 Previous + 2 Correct Call = -2). These are the 119th and 120th ejection of the 2015 MLB Regular Season. This is the 56th player ejection of 2015. Prior to ejection, Molina was 1-3 in the contest. This is the 55th Manager ejection of 2015. This is the Cardinals' 4/5th ejection of 2015, T-1st in the NL Central (CIN, STL 5; CHC, MIL 3; PIT 2). This is Yadier Molina's first ejection since June 2, 2013 (Clint Fagan; QOC = Y [Safe/Out]). 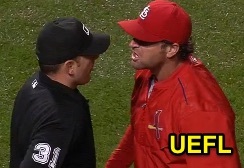 This is Mike Matheny's 2nd ejection of 2015, 1st since June 2 (Joe West; QOC = N [Balls/Strikes]). This is Pat Hoberg's first ejection since yesterday, June 7, 2015 (Seth Maness; QOC = Y [Fair/Foul]).